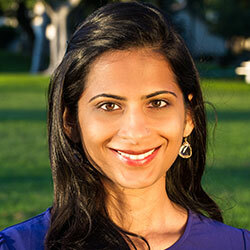 Dhara Meghani, Ph.D. is a licensed clinical psychologist and assistant professor at the University of San Francisco Clinical Psychology PsyD Program. Her teaching, clinical experiences, and research focus on infancy, parenting, and family relationships within diverse populations. Dhara founded Parentline in 2016, which is a free telehealth counseling service for expecting and new parents of children birth to three. Parentline serves the SF Bay Area and is staffed by supervised doctoral students in the USF PsyD program. Previously, Dhara worked for the Fussy Baby Network and held a faculty position at the Erikson Institute in Chicago, IL, a graduate institution for child development. Dhara graduated with a B.A. in psychology from UC Berkeley and an M.S. and Ph.D. in clinical psychology from the University of Massachusetts Amherst. She completed her internship and postdoctoral fellowship at the University of California San Francisco/San Francisco General Hospital Child Trauma Research Program, where she worked extensively with children and families exposed to trauma in the prenatal and early childhood period.